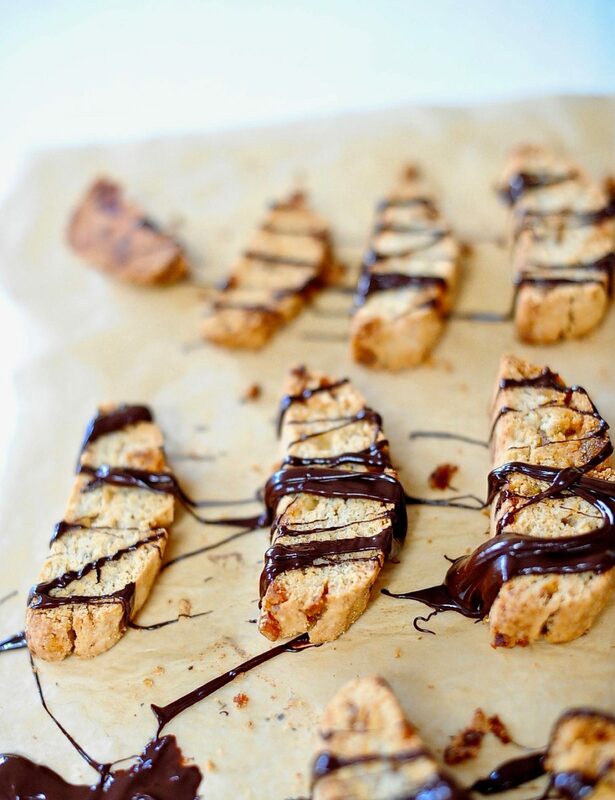 Dark Chocolate Drizzled Crystallized Ginger Vegan Biscotti. 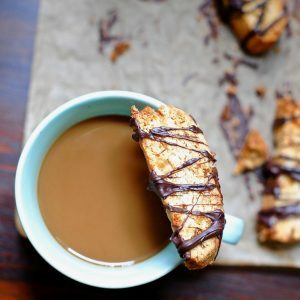 At the age of three my daughter became obsessed with the biscotti sold at a certain Old World Italian bakery in Providence, RI. You never know where you will find a treasure. Remember that. Here was the ritual that grew to surround our monthly biscotti pilgrimage. We’d arrive at Scialo Bros bakery in late afternoon as the sun slanted amber through the bakery’s smudged windows filled with dusty elaborate post-war wedding cakes and old silver framed, tinted portraits of brides and grooms. Standing in the half melted snowdrifts, with numb fingers and red cheeks we’d dream about weddings past; the dresses, the music, the love stories played out in tiers of butter, flour and sugar. Like a school of fish, the customers inside would turn to gaze at us, as we entered to the tinkle of the bronze bell over the heavy wooden door. Just as quickly they’d return to the bustle of ordering and selling. Warm, vanilla scented air embraced and intoxicated us. We would hang back whispering to each other, pointing to the pastries in the cooler, contemplating the trays of cookies that were a study in browns and golds. We knew in our heart of hearts exactly what we were going to order but there was a set ritual to be followed, we were prolonging the sweetness. The heavy breasted italian matrons ordered their gold and silver dipped Jordan Almonds and white boxes of assorted pink and green cookies for Friday night while gently complaining about their husband’s bad habits. Finally we’d que up and place our order, three anise biscotti and three wine biscuits. Everything was done in threes because Livy was three and therefore three was the magic number. I also always bought a loaf of bread, still warm from the oven, with crust so shatteringly crisp the bread would rustle, like newspapers in the wind, the whole walk home. We will be in the valley of love and delight. If you are in a crisp come kind of mood check maybe you’d like my copycat vegan Mint Milano cookies. Or perhaps you just want to dive into a vat of airy silky dark Chocolate Orange Mousse. 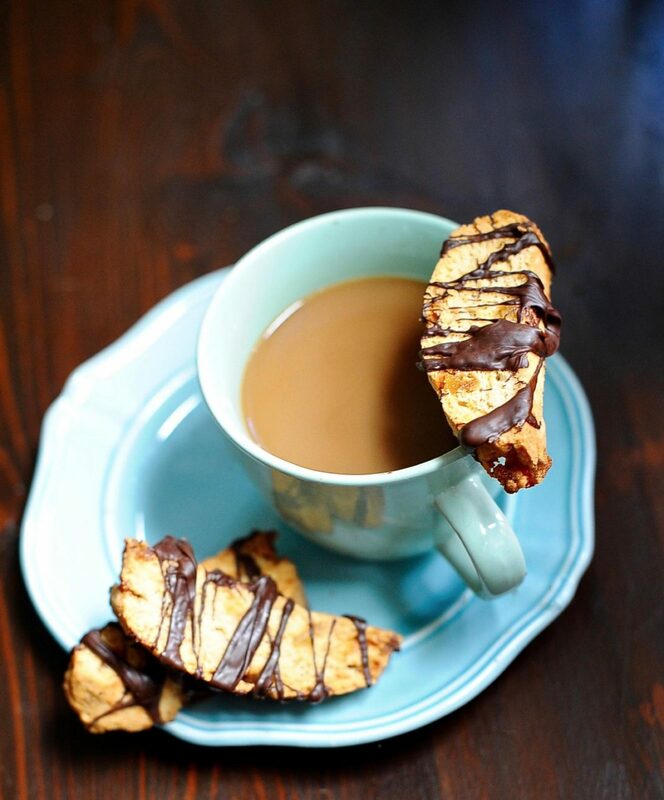 Golden twice baked cookies, studded with crystalized ginger, and drizzled with dark chocolate. These are not tooth breakers but they have enough crunch to stand up to a dipping in hot coffee. They will keep for up to two weeks stored in a tin. Combine flour, sugar, baking powder, and salt in the bowl of a food Processor. Add the butter and and pulse until you have a sandy texture. If you don't have a Food Processor then you can easily make this in a bowl like you would a pie crust. Just work fast you don't want the butter to melt. In a separate bowl whisk together the creamer and aquafaba until a frothy forms. Add the ginger bits to the wet. Mix the wet ingredients into the dry and knead by hand for 1 minute until you have a ball of very soft dough. Cut the dough into two pieces one a baking tray with parchment and form two flattish 9 inch logs on the tray. Bake for 25 minutes. 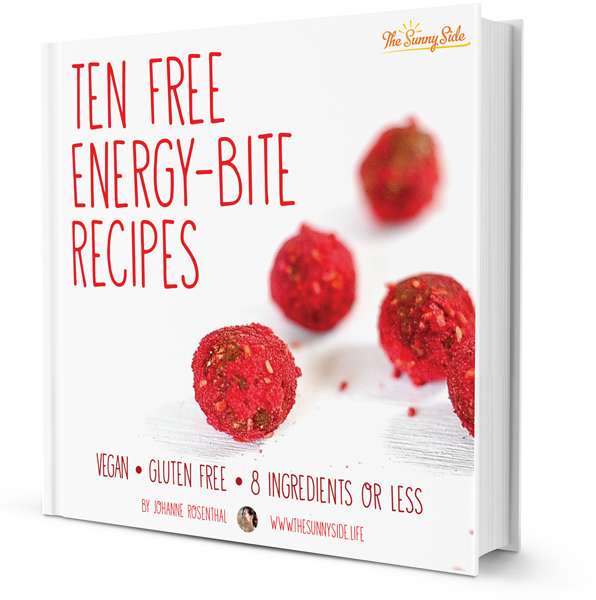 Remove from ovum and allow to cool. Slice into 1 1/2 inch thick slices and lay them out on the tray. Bake them for 30 minutes turning them 1/2 way. 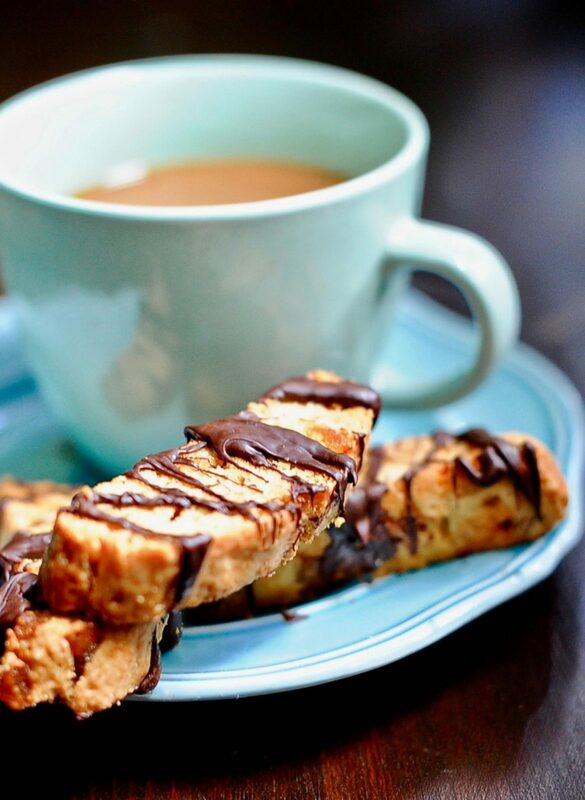 Once cool drizzle with melted dark chocolate. You made being three magical for her. I love the photos in this post, and I checked out your very clear and helpful aquafaba page so I’m just about ready to take the aquafaba plunge.